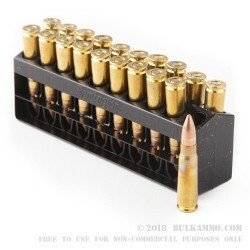 A premium quality brass cased variant of the proven 7.62x39 cartridge that was made famous in the AK-47, SKS and various other clones. This is a load that is particularly well suited to the sometimes finicky AR platform rifles that are built for the 7.62x39 caliber. It is also very well placed to be used in bolt actions that are now chambered to use 7.62x39 ammo. 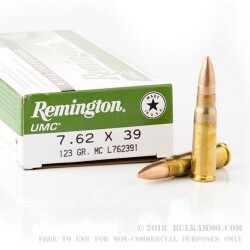 The Remington UMC line is a value priced, high reliability brand line that has been used at different times in the history of the Remington Company to market mainstream loads for popular cartridges. In this case, the round sees a significant price increase compared to some available market options but is still priced at a good entry point for the competing 7.62x39 cartridges that feature brass casings and boxer primers. This load allows easy reloading, and can be particularly valuable to those looking to play around with the handloading of the cartridge. 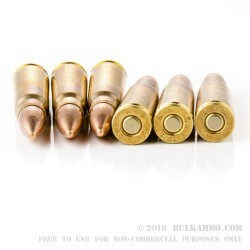 The 123 grain projectile is a full metal jacket and offers moderate ballistics directly in line with those offered in the more popular cheaper steel cased, Russian manufactured rounds. The same holds true for those rounds produced in other countries with the same Steel/Berdan primed variant combination.